Imagine a world where the inmates dictated the routines of the guards and wardens of a prison. Parishioners at church mandated certain sermons for the minister on Sunday. Crowds of spectators made on-the-field decisions for sports teams. Such is the situation in many school systems across America. In the march to vilify teachers as a hindrance to progress, “reformers” have “empowered” parents and students into making decisions largely left to teachers and administrators. Reformers, administrators and naïve parents have worked to strip power from the very people that make school effective in the first place. Not only is this a gross sign of disrespect to the teaching profession, but runs counter to over 800 years of scholastic tradition in Europe and America. In the development of scholastic education in Western Europe, two main systems emerged in the Middle Ages. One, the older of the two, was the Bologna system patterned after the University of Bologna, which is still the oldest continuously-running institution of higher learning in the world. In this system, a school was a corporation of the students. The students organized the government of the school, hired the faculty, and managed the faculty for the needs of the students. In essence, the students had all the power, and the faculty served at their pleasure. This system made sense in Bologna, because it was primarily a professional school that granted strictly doctoral degrees in law and medicine. Thus, only the most dedicated and rigorous students would even apply in the first place. Yet there were flaws: students became difficult to control, drunken orgies were commonplace, and civil authorities could do little as students claimed the same rights and privileges as clerics. In the University of Paris, a new system of school governance emerged, not long after Bologna’s founding. Under the Paris system, the power was shifted from the students to the masters. The university would be a corporation of the faculty, which set down rules and governance, established the curriculum and guidelines for graduation as they saw fit, and maintained order and discipline among the student body. Again, this made sense in Paris since the student body was comprised of many young students, often as young as 8 or 9. The curriculum was based more on the arts and theology, although law and medicine were also offered. Furthermore, it offered more than one degree, the baccalaureate (or bachelors) and the doctorate. In 1167, King Henry II of England banned English students from studying at the University of Paris. It wasn’t their fault, just good old European politics, and they’d be invited back in the mid 13th century. The now-displaced Paris students established the English universities of Oxford and Cambridge (along with that important legacy of English smugness). 500 years later, the descendants of the Oxbridge alumni would establish other universities in the New World along the lines of the Paris system (with an even more insufferable brand of smugness). Finally, the graduates of the bastions of learning in the United States helped to form America’s public education systems. That system of K-12 learning still utilizes the Paris model to an extent. While a high authority establishes the curriculum, and a separate administrative body handles general school governance, it is the corps of faculty that manages the day-to-day needs of the students in the best way possible. 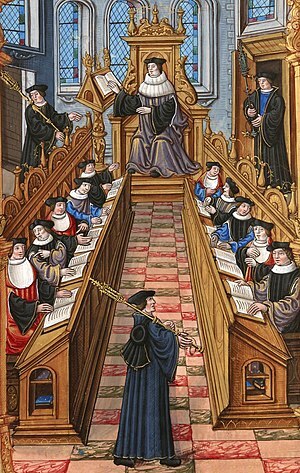 The teachers, like the medieval masters of Paris and Oxford, were considered “experts” in their field. This allowed them a degree of flexibility when planning lessons, establishing routines and procedures, and managing the classroom. Parents listened to their counsel with the same respect due a doctor or even an ordained minister, and trusted that teachers knew what was best in the education of their children. After numerous reports showing the ruinous state of our children’s education, one factor became paramount among “reformers.” The “expert” in education, the teacher, was almost solely to blame in America’s downward educational spiral. Thus, it was important to give parents more control over their child’s education. Home schooling, charters, vouchers—all were designed to make parents (and in a subversive way, students) the principal actors in their learning. Along with the “parents first” approach came a noticeable uptick in litigation over perceived abuses in the system. Parent-teacher conferences and visit to the principal’s office now require phalanxes of attorneys ready to serve on any perceived slight by the child. What’s worse, administrations on the district level set up protocols and controls that make teachers virtual whipping boys in even the most frivolous complaints. Both of these developments due, unfortunately, have some basis in fact. Teacher training and education has long been an Achilles ’ heel in developing quality education. It’s hard to be an “expert” when there’s little scrutiny or rigor in selecting and training great educators. Furthermore, one cannot overstate the very real abuses that take place in many classrooms. Verbal, emotional, and often physical abuse did, and still does, occur. No good teacher should engage in such negative behavior with students. Excesses in the system need to be controlled, even by legal means. However, education is not served by handcuffing teachers with burdensome regulations, litigious parents and administrations quick to blame a scapegoat instead of standing firm with the faculty for the good of quality education. Parents should be fully involved in a child’s education. Yet rather than sit parents and teachers together to solve common problems, reformers have set parents against teachers like rabid dogs in a fighting pit. Thanks to half-truths and hypercharged rhetoric, parents see the teacher as the enemy, with no room for compromise. If a parent thinks they can teach their kid better than a teacher, by all means, go ahead. If a parent thinks a charter school or a private school can educate better than a regular public school, best of luck to you. But be warned: parents, if you choose to send your child into a school, any school, be prepared to surrender some of your power and discretion for the best interests of a child’s education. In all schools—public, private or charter—parents need to trust that teachers are doing the right thing. All the teacher programs in the world, TFA, Teaching Fellows and the rest, are efforts in futility unless teachers are again regarded as “experts” who demand respect and discretion (to an extent, of course). Second-guessing teachers rarely helps a child, but rather gives more anxiety to an already tense situation. Maybe education in this country never fully resembled the Paris model to which the lads of Harvard and Yale aspired. Yet it was a model that set the standard for Europe and America for almost a millennium. Rarely did a teaching workshop produce such a valuable resource as my first. Around my second year teaching, I was at a low ebb. I had a terrible class, nothing was getting done, and my room was a mess. Curiously, it was at this point that I signed up for my first Teaching American History grant seminar. There was little else I was doing on Saturday mornings in the fall, anyway. It would be an experience that changed me forever, as a teacher and as a historian. Over the course of five years, I have listened to incredible history professors, sitting with like-minded teachers who also felt frustrated in the current educational environment. Furthermore, the TAH program helped to ensure that the concepts learned could be applied to any classroom–and that means ANY level, from elementary to high school. TAH was also a fountain of resources, books, videos and classroom materials. Yet none would be more cherished than a black-covered book, now dog-eared and bookmarked to death. It has become, quite literally, my Bible in the classroom. 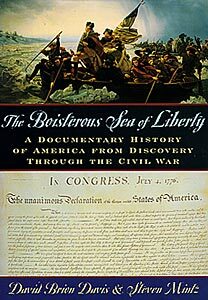 In 1998, distinguished Yale professor David Brion Davis, along with University of Houston historian Steven Mintz, co-edited an anthology of primary sources called The Boisterous Sea of Liberty: A Documentary History of America from Discovery through the Civil War. The book is much more than an anthology–it is exactly as the title states: a history of the United States as told through the primary resources of the period. Yet this book could be simply a set of primary documents bond together. Thankfully Davis and Mintz included their own commentary and created a straightforward, dense, comprehensive narrative of the American story, using the primary sources as a the driving force. This is where the “textbook” aspect of this book is done right: often, teachers lack the context or background knowledge behind such famous documents as the Mayflower Compact, Columbus’ Letters to the Sovereigns or the Emancipation Proclamation (all included in the book, by the way). Davis and Mintz provide a refreshingly nuanced, evenhanded view of events that doesn’ t create sacred cows, yet won’t necessarily jump on the Howard Zinn-esque revisionist bandwagon. This approach is perfect for average readers who see this book as a narrative that explains, guides and instructs the reader on the events, concepts and ideas of American history. As an educator, the real treasure is the primary documents themselves. The commentary is important and very well written. However, the primary sources are what make this book an integral part of any history classroom. Most of the primary quotes I use in this blog, if not all, come from Boisterous Sea of Liberty (at least those quotes pertaining to before the Civil War). These documents have been printed and reprinted and recopied and reused ad infinitum for classroom exercises, tests, lesson plans, assessment portfolios and even professional development. Even in the classroom itself, Boisterous Sea of Liberty holds a certain allure. My students always know that when I whip that book out, something important, shocking or interesting will be shared today. In fact, they have given it a nickname: “The Book of Sadness”, since I have a tendency to use it for tragic or horrible events. Case in point: the Schenectady massacre of 1690. During the ongoing wars between the French and English, the New York settlement of Schenectady was attacked by French soldiers and their native allies. Robert Livingston provides a particularly grueseome account, full of wailing victims and children’s brains getting bashed. The scene is hard to read, even for a teacher well divorced from the situation. Yet this account allows students to live their history in all its gory details. Boisterous Sea of Liberty has become a backbone of my curriculum design, lesson planning and assessment. The results are truly remarkable: students are, often for the first time, thinking critically not only about events, but the authorship and authenticity of primary accounts. My kids are making important connections between historical events and current situations in our world. Most important for me, though, is that for the first time, my students are actually excited about social studies. It stimulates their brains, forces them to think, encourages them to look for their own solutions. Primary sources have “emancipated” students from the shackles of textbooks and test prep workbooks. Boisterous Sea of Liberty is a must-have, in fact one of the few must-haves that a social studies teacher should own. I can’t imagine teaching without it–and neither will you.